Our brand portfolio consists of co-ordinated ranges that have been designed, marketed and distributed for all types of educational establishments and aimed to make students look good and feel proud. We pride ourselves in providing consistent, quality garments and service to match. 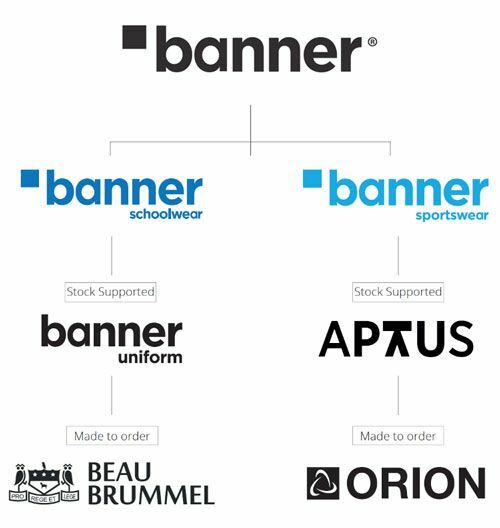 Our Banner everyday schoolwear is available all year round for next day delivery. We can customise our stocked garments with embroidery and trim options to give your school a special individual look. Our iconic boys and girls blazer and jacket collections are steeped in rich heritage – from the traditional three patched pocket Ziggys blazer to the new innovatively styled Signature jacket. Banner blazers and jackets are not only timeless, but they are constructed from a variety of fabrics that offer different aesthetic or functional purposes. All our blazers and jackets vary in design, fit and style offering schools and students choice. Our four suiting options offer flattering blends of fabrics and styles for schools that want to transform their school uniform into something truly special. Our high quality fabric compositions offer comfort and a superior feel for the wearer whilst the cut and versatile shape gives a modern and tailored fit. Our knitwear options combine comfort with durability and can be worn as a standalone uniform garment or look flattering under our blazers or jackets. All our knitwear has a raglan sleeve to give the wearer increased comfort and shape, whilst the rib cuffs and welts give extra support. Knitwear has become a popular addition to school uniform and our extensive range of options from traditional V-neck jumper, slipover and cardigans to choose from make them a great uniform garment. The additional feature of including trim colours to the neck, cuffs, welt and stolling has meant schools can have that added personalisation which can either compliment or contrast blazer and jacket trims. Finally, we offer a variety of Shirts, Blouses, Skirts, Dresses, Trousers, Poloshirts, Sweatshirts, T-Shirts and Outerwear from our stock supported range and also our made to order range for schools wanting a unique look. Beau Brummel is our well established brand renowned for exceptional bespoke tailoring solutions for schools wanting a unique uniform and personalised service. The origins of the Beau Brummel bespoke schoolwear began over 150 years ago in 1851. John Barran, the legendary clothing manufacturer, started his business with 20 sewing machines in Leeds later becoming famous for his innovative approach to clothing by revolutionising the school blazer. By the 1970s, when the company was manufacturing schoolwear they changed the name to what is known today as Beau Brummel. Today’s collection of sophisticated bespoke garments includes traditional Blazers, modern fitted Jackets which can be personalised with bound, taped or corded edges in an array of colours. Blazers and Jackets can also be enhanced with different coloured lining options, insert colour piping, special buttons and embroidery. Our suiting options offer flattering blends of fabrics and styles for schools that want to transform their school uniform into something truly special while our dresses, skirt, kilts and pinafores can all be made to your individual requirements. Bespoke knitwear options combine comfort with durability and can be worn as a standalone uniform garment or look flattering under our blazers or jackets. All our knitwear has a raglan sleeve to give the wearer shape and the rib cuffs and welts give extra support. Knitwear has become a popular addition to school uniform and our extensive range of options from traditional V-neck jumper, slipover and cardigans to choose from make them a great uniform garment. The additional feature of including trim colours to the neck, cuffs, welt and strolling has meant schools can have that added personalisation which can either compliment or contrast blazer and jacket trims. Part of our Beau Brummel collection is the distinctive Hainsworth cloth that has been coveted by weaving mills globally. The attention to detail is pure passion and craftsmanship combined with a long-standing Hainsworth family heritage over 230 years. The distinctive Hainsworth cloth is controlled all the way down to the placement of individual fibres to ensure garments have an unmatched lustre, feel, durability and drape for schools wanting that unique look and a piece of great English history. The garments have been designed to accommodate all sporting activities and all share the same versatile and robust nature that Banner is renowned for. The combination of fabrics and designs make Banner Sportswear a great alternative to APTUS Performance for those schools wanting a more traditional sporting look. The Banner Sportswear range consists of time-tested garments that have been built to last and combine comfort with durability. The three different Rugby shirts offer a vast array of colours and reversible options and can be matched with three different designs of Rugby shorts. The Polo shirts are available in both male and female styles and compliment the fleece or tracksuit top as a layering up option. After its successful launch the APTUS range has been truly accepted into the educational sector by both students and staff participating in on and off-field activities. With its stylish aesthetic overall looks, APTUS offers a great performance solution across all sports. The girls specific range, created in close consultation with female PE staff and students’ contours with the body during activity, creating flattering silhouettes. Head of Design, Emma Robertson states ‘the central concept behind our female range was to encourage girls to participate in sport at school with clothes that flatter, boost body confidence and actually perform’. The female leggings have been a breath of fresh air to schools along with the training top that has a hidden cord in the seams to allow the top to be adjusted in length for the more body conscious. Today’s obsession with technology shows no sign of slowing down and APTUS has its fair share of technological properties. APTUS garments are constructed using a combination of lightweight breathable performance fabrics along with 3D dimple mesh panels to create garments that are comfortable and effective to play sport in. APTUS developments include the introduction of the new Rugby Shirt, Rugby Short, Football Short and Swacket. Each garment has been expertly engineered for the chosen activity on and off the field. Orion offers the ultimate choice in modern, technical bespoke sportswear across a range of sporting activities for schools, teams and clubs wanting a unique look. Orion bespoke sportswear has been developed using a cohesive range of technical sportswear garments. Orion sublimated garments have been designed and are made in the UK in a variety of standard and bespoke designs to suit a school, team or club’s requirements. Orion sublimation is also supported by contemporary cut and sew garments, giving a school or team a professional look with comfortable product that consistently performs. We offer a variety of design looks within our ranges, which are available in a vast array of colours to suit your school, team or club. All sublimated garments can be designed easily using our new online 3D Kit Builder, where garments can be viewed in 360 degrees, enabling you to see your design from all angles. You can also save your designs and send them to team mates, or simply order online as soon as you’re happy with your look. Alternatively, our dedicated team of expert designers and sales team, who have many years’ experience, are here to work closely with you to create your special individual look, and deliver a first class bespoke sportswear and teamwear solution. Finally, the team at Banner welcomes you to come and visit us and witness our operation in full flow. We are here to discuss our product, marketing support and your requirements for the coming year. Please contact us for more information or to arrange an appointment.